Microscopic sessions have again been conducted upon particulates collected from an outdoor HEPA filter in operation at Santa Fe, NM. It is with some dismay that I must report that the earlier findings of unexpected biological components have again been repeated. There now exists a continuous record of similar findings over a two to three year period, and the issue has now evolved far beyond that of debate alone. The best analysis available from a combination of sources continues to affirm the identification of the shown biological components as being that of erythrocytes, or red blood cells. The refusal of the United States Environmental Protection Agency to identify certain fibrous materials and biological components within that material is deeply entrenched into these current findings. Any efforts to confirm, refute, discredit or affirm the current findings must be done in a public venue under professional laboratory conditions with independent verification. It is acknowledged that the laboratory facilities available to this researcher are extremely limited in scope, and they are inadequate to allow final judgment on the grave concerns that are raised. The repetition of the findings from multiple methods and sources across a long span of time is sufficient to mandate that such public and professional testing now occur. The interests of the public welfare must be served in a legitimate manner, and inflammatory debate prior to those test results is a moot exercise. In the interim, citizens may wish to consider and act upon the health implications inherent within this report. Concavities characteristic of erthryocytes visible under close inspection. 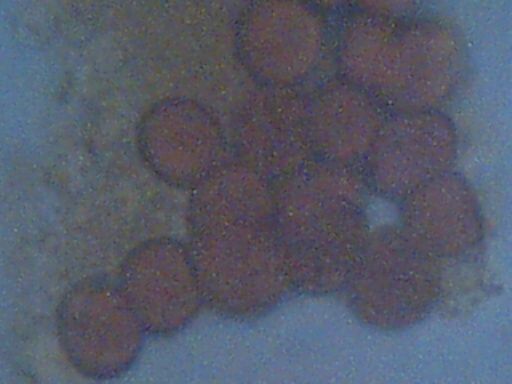 The first component is that of the apparent erythrocytes. 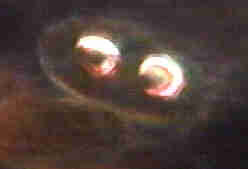 These usually occur in clusters, although they occasionally occur individually. The cells appear to be of a dessicated form, as has been mentioned and inferred from the onset of these findings over three years ago. This conclusion is based upon the measurement of the cells in their original form, which approximates 4 microns. A table of blood cell sizes for various species is available at this page: Biological Operations Confirmed (Feb 25 2001). When the cells are subjected to certain solutes, however, the cells enlarge and attain a final size of approximately 6 to 7 microns; this size approximates that of the human cell. Eosin and iodine stains have been used in the current investigation; iodine appears to play a role in the reconstitution to the larger size. Upon extended exposure to the iodine stain, the cells will eventually become distorted and the characteristic biconcavities will diminish. The stain used, eosin or iodine, is of value primarily for the visual detection of the matrix structure, and to enhance contrast for the cell structures shown. The second component within this discussion is to be designated as the ‘matrix’ material. The composition of this structure is unidentified in all ways, other than it appears to be of a definite biological nature. The term ‘matrix’ has been contributed by an independent researcher involved in the video microscopy session referred to earlier, where a binding structure within the earlier fibrous sample was observed and noted by that individual. The term is used in the same sense here, as it appears this granular material may also serve a binding function. It may also serve as a nutrient source to the bacteria which will be described later. The cells are usually found to be interspersed within this matrix material. The matrix is distinctively visible under both eosin and iodine stains. The third and final component has not been observed in prior sessions, and is a result of modifications to the sampling method that have developed. The method of sampling will be described in more detail at a later stage. In the presence of a dilute eosin stain, a motile form of bacteria can be repeatedly observed circulating in and about the granular matrix structure. The bacteria (presumed) are extremely small in size, and are estimated at 1-2 microns in size. This size range is at the limit of visible light microscopy and thus further evaluation will be difficult from this station. The bacteria appear frequently in a combined or colony form, and they appear to be attracted to the matrix – cellular structures. This observed behavior is the basis of suggestion for the matrix serving as a potential nutrient source for the bacteria. The dilute eosin stain makes the bacteria visible and does not cause immediate death; the use of iodine stain in contrast immediately kills these bacteria under observation. The species of bacteria observed requires prompt identification, along with all other components that are shown. 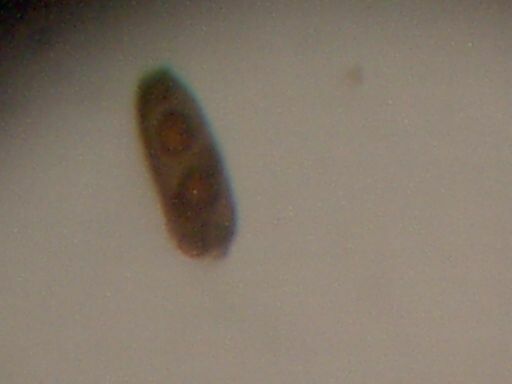 The ability to observe these bacteria in a live form is a direct result of the solution method of sampling that has been incorporated into the current research. 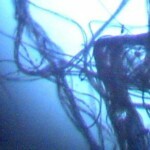 ‘Matrix” material visible across span of sample. Concavities characteristic of erthryocytes visible with shading. The presentation of the microphotographs on this page at a magnification of approximately 5000 times is an extension to typical light microscopy. The normal limit of magnification with visible light microscopy is on the order of 1000x to 2000x, and the collection of adequate light at the higher magnification levels becomes increasingly difficult. A method has been developed which combines the use of a digital eyepiece(CCD-charge coupled device) with a conventional microscope objective. This method, combined with the use of oil immersion techniques, has provided for the greater magnification of images shown here. Availability of adequate light as well as resolution remain as limiting factors as to what can be accomplished with available equipment..
Isolated example found and photographed. A HEPA filter has again been placed outdoors in a highly rural environment. The elevation of the filter during the most recent session is at approximately 6 feet above ground level. Earlier sessions have had the filter approximately 12 feet above ground level. The filter was operated full time for approximately 5 days before the sampling process began. The filter element was temporarily removed, and small sections of the filter were removed with small scissors before returning the filter to operation outdoors. Approximately 3 to 4 sections of the paper filter element approximately 5mm by 15mm were removed for each trial. The small cuts from the filter element were then placed into approximately 3-4ml of distilled water within a test tube and allowed to stand for approximately 15 minutes at room temperature. Some trials allowed the solution to be warmed to approximately 75-80deg F. with external heat, and also the test tube was shaken at various intervals. 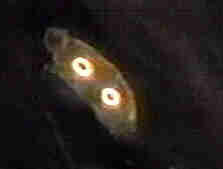 Two drops of the solution were then placed onto a microscope slide. Initial tests were conducted with the use of eosin stain, which allows cytoplasm detection. One drop of eosin stain was added to the two drops of solution on the slide and a slide cover placed on top to create a wet slide. Detection and magnification of the various components up to a maximum of 5000x was then accomplished. Additional trials used iodine stains, with the differences in visibility of the various components as described above. The use of the dilute eosin stain allows the bacteria to be observed alive; the use of the iodine stain appears favorable to the matrix detection. Sampling was conducted consecutively for approximately 5 days with the same results being achieved on each occasion. The following statement has recently been made available by a citizen on the public message board attached to www.carnicom.com (Dec 31 2002). The information presented is considered to be of significant bearing upon the current investigation, and is therefore made available for the public to consider. Additional observational comments will be made at the end of this statement. “Cliff carefully documented and described the methodology that he used in this test, telling how he carefully soaked the filters in distilled water for 15 minutes, then looked at the water under a microscope, and he even showed us photos of what he saw. Well, as I told you all two weeks ago, on your very own “research” page, it is absolutely impossible that what the objects you see there are red blood cells. Why? Because if you put red blood cells in distilled water, they swell up and burst, destroying themselves, within a matter of seconds! That’s why. You see, red blood cells are not designed to live in a neutral environment. They are designed to live in a SALTY environment. If the salt content is LESS than about 0.5%, then red blood cells absorb too much water, swell up, and burst. If the environment is too salty (more than about 1.5%), then they release too much water, and shrivel up. For a red blood cell to survive, it needs to be in an environment where the salt content is around 1%. Too high or two low kills it, and it destroys itself. So, seeing that Cliff did his experiment in DISTILLED water, any red blood cells that MIGHT have been there were certainly destroyed. 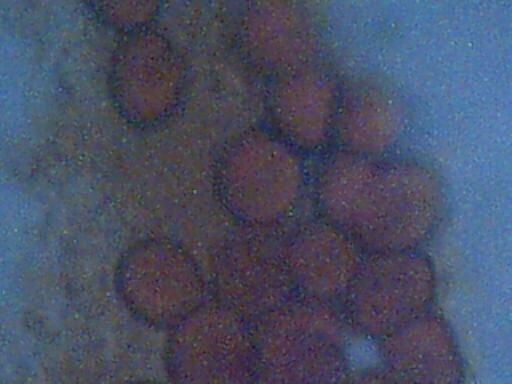 So, whatever those things are in the photos that he showed us, they most certainly are NOT red blood cells. The factual information offered by the party above is beneficial, and it may have a significant bearing on the final identification of the components repeatedly identified and photographed. Unfortunately, the statement does not encompass all of the information that can now be discerned from sustained observation, it does not fully consider the potential effects from the first statement itemized above (if borne out to be a valid observation) and it does not satisfy the primary requirement of the second statement. No finality on this issue will be reached until the proper appealed for tests are conducted. The essentials of the statement as provided by the third party are true, at least as is evidenced by direct observation from this researcher. I have sampled my own blood, placed that sample within distilled water, and have noted the observations under the microscope for about a ten minute period. After the elapse of this time, eosin stain was used to provide visibility of the cells. Human blood cells, unmodified in any fashion, and placed into distilled water, follow the behavior essentially as described by this party. There is some variance in the level of distortion and destruction reached by individual cells within a given time period. The sensitivity of erthryocytes to saline conditions is undoubtedly an important characteristic and it is helpful for the identification of cells which are known to be unmodified from their source, and the contribution to that end is sincerely acknowledged. Since to my knowledge none of the parties (myself included) evaluating this subject has claimed professional biological expertise, certain ambiguities are going to remain until the proper testing procedures under the conditions specified are conducted. The importance of the second itemized statement is again affirmed. The components presented may involve a process of dessication. If this supposition is correct, it indicates a significant modification to the original cellular form that may produce notable variations in behavior with respect to solutes. This supposition is based upon the varying behavior of the size of the cells under certain stains, solutes and liquids over a period of time, as well as their subsequent deterioration of form as referred to in the factual statement that has been quoted. The statement provided by the third party may not at all be inconsistent with observations that have been and continue to be conducted; additional work to this end is required. Again, the need for proper testing separate from inadequate discussion and remote evaluation remains. The health professional who made the original observations of similar components within fibrous material delivered to the EPA (with a subsequent refusal to identify that material) made a similar initial assessment; that is, the prospect of dessication appeared to be a distinct possibility. In addition, further modifications must also be allowed for in the nature of the cellular components due to the unexpected conditions from which they have been sampled. It may be a completely inadequate approach to assume the behavior of the components presented follows in behavior to that of unmodified cells from a live source. If one allows for the prospect of variable behavior in the comparison of presumed dessicated cells with live cells directly from a human source, the current observations again are not inconsistent with the third party quote. Referring to the recent live cell test with distilled water, the visual characteristics remain remarkably similar to what has been observed. Even though varying levels of distortion and enlargement of the cells take place, the biconcave structure of the engorged cells often still remains clearly discernible and distinctive. The majority of cells show significant deterioration within a few minutes time to where they are largely unrecognizable, other cells are disturbed relatively little and maintain the circular biconcave form distinctive of erythrocytes. The variation of size that occurs is also not inconsistent with observations that have been made of cells apparently under stress when placed in various solutions; an increased size from 4 to 7 microns commonly transpires and eventual amorphous distortion frequently occurs. Again, only proper testing will resolve these ambiguities. An additional concern that remains, and which appears to be inadequately addressed by the quote above, is that of the conglomerate biological form which is under scrutiny. It will be necessary to consider the sum of observations that have been presented. These include the frequent appearance of what has been designated as the matrix material usually binding the cellular structures. This would appear to be a distinct cytoplasmic based structure, due to the receptiveness of the eosin and iodine stains. Observation from the perspective of the internet is again insufficient on this matter, and proper testing with independent verification is required. The joint appearance of these two dissimilar forms, cellular and granular, will require adequate explanation and identification. 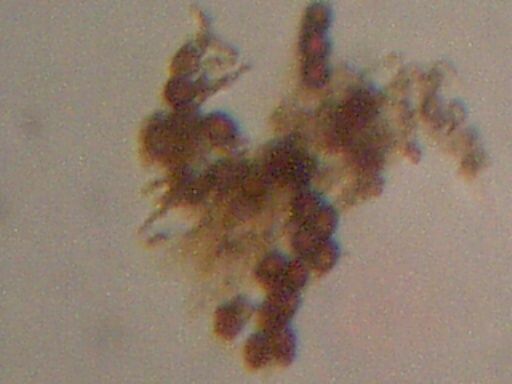 A remaining issue is the apparent abundant and repeated presence of a motile bacterial (assumed bacterial at this stage) form within the conglomerate shown. The apparent attraction of these bacteria to the granular and cellular forms is of special interest, and also requires proper identification and testing. Observations at this time appear to indicate biological form of animal nature as opposed to the plant kingdom. Species type, if applicable, remains another open topic of investigation. Lastly, any claims of ‘looking like pollen’ appear to be woefully inadequate at this time. The question of pollen forms has been and remains under consideration by this researcher. Efforts have been made to identify certain common forms of pollen that occur in this region, and photographs to that effect under the microscope are also documented within this site. The pollens of pine and juniper are quite distinctive in form as well as in a completely separate class with respect to sizes measured. At this time, no common biconcave circular forms of pollen in the size range of approximately four to seven microns of distinctive color, attractive to motile bacteria and enmeshed within a biological granular structure have been identified. Research on this topic can remain as an open prospect to all concerned parties. In summary, the report as presented on this site, as well as those of similar finding which have accrued over the past several years, remains as stated. The conditions of proper testing and identification remains; limited merit and attention is to be given to armchair discussion on the serious questions that are raised. It is my hope that the findings within this report can ultimately be rejected as false; this is unfortunately not the case under the current conditions. Any subsequent comments that have been made by any party to the effect that certain “flaws” in an”experiment” have been acknowledged by myself are mispresentative of the reported findings, and they are inaccurate. This statement extends to the originator of the quotation cited above. This report describes a set of current and historical observations as well as an original and repeated call for complete and proper testing to serve the public interest, and the results of this work stand without qualification or exception.